Every day we meet customers who are unsure whether to tile the floor and walls within the bathroom. We understand that it is a commitment and unlike a painted a wall, it can't be changed overnight. So we have put together some of the commonly asked questions to help you make an informed decision with your decorating project. What are the advantages of fully tiling a bathroom? Bathrooms will always be full of moisture and as a humid environment, it is important that the right measures are taken to ensure the space doesn't lead to damp, condensation and mould. This can be helped by increasing the temperature of the bathroom, extracting moisture from the air and using specialist anti-mould products, but it won't always stop painted walls or wooden floors looking tired and harbouring germs. Many people are now opting for a completely tiled room so that walls and flooring aren't affected by the above. The low maintenance of tiles ensures that dirt and grime can be easily wiped away and with a variety of colours, finishes and sizes to choose from, there will always be a tile to suit everyone's tastes. As bathrooms tend to be smaller, it can be more cost-effective in the long run to tile the space. Tiles vary in price and even if you opted for something on the expensive end of the spectrum, comparing it with the longevity and the minimal upkeep, it remains the best option pound for pound. What are the disadvantages of fully tiling a bathroom? Installation time can be lengthy especially because care needs to be taken to prepare the floor and walls properly. The surfaces also need to be level and smooth which can take longer should there be any issues. If the room is particularly large, the cost to buy and fit the tiles can become a little expensive. It's best to get a few quotes from tilers and ask to see examples of their work, although one may be cheaper, it could be that their care and attention to detail isn't as good as others, so do shop around. Cleaning the grout is also super important but it can be time consuming and it will require elbow grease! Just make sure to prioritise time each month and keep on top of it. What colours work best in bathrooms? There are no rules when it comes to the 'right' colour in bathrooms; many people opt for neutral tones so that it brightens up the space but it doesn't mean that dark tiles are a no go – try them on the floor for a contrasting and sophisticated look. We do always recommend that before deciding on your favourite tile, consider what accessories will work with the colour scheme. Are there towels and bath mats that complement the shade? What colour grout will work best? What colour brassware will go? Which tiles work best on bathroom floors? When tiling any surface, you need to take into account what it is being used for. 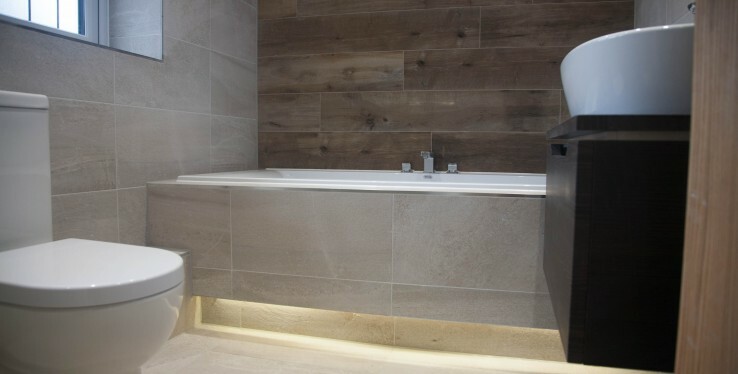 With bathroom floors, they are more than likely to become wet after a bath or shower and so it is important that a textured tile is chosen to avoid any slips. Porcelain wood effect tiles work really well as they have grain like properties on the surface, as do tiles with a natural stone appearance. Porcelain has a very low absorbency and a very hardwearing which is important for bathrooms. There are many myths when it comes to which tile sizes should be used in bathrooms, especially that large tiles shouldn't be installed into small spaces. Large format tiles actually work extremely well in small rooms and create the illusion of a bigger area. Due the size, there is also less grout which means minimal maintenance. Mosaic tiles have been a popular choice for many years, however, people tend to use them now as a feature rather than all over, which can look much better and less overpowering. Should I tile the ceiling? We don't recommend fitting tiles to a ceiling, not just because it is often problematic during installation but mainly for safety reasons. If you want a cohesive look, try painting the ceiling a shade close to your wall tiles. We hope that this blog answers some of your initial questions and for more information and advice, contact the expert Real Stone & Tile's team or pop into the Cheadle showroom.